Coexistence agreements – are you in danger of just agreeing now to disagree later? The latest advocate general opinion on keyword advertising has recently been issued in Interflora Inc v Marks & Spencer plc (Case C-323/09), a reference for a preliminary ruling by the High Court of Justice of England and Wales. Most commentators view the opinion as a victory for Interflora, although some argue that the advocate general did not think that what Marks & Spencer (M&S) is doing is unfair. 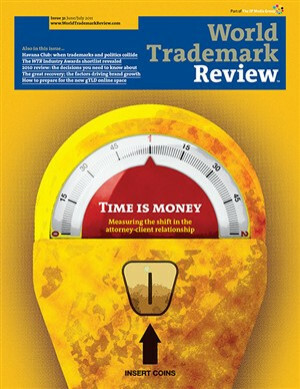 The Max Planck Institute for Intellectual Property and Competition Law has published its Study on the Overall Functioning of the European Trademark System, with genuine use and the relationship between the Office for Harmonisation in the Internal Market (OHIM) and national offices at the centre of subsequent discussion. The Internet Corporation for Assigned Names and Numbers (ICANN) has set a June launch date for the new generic toplevel domains (gTLDs), following the failure to launch the programme at its March meeting in San Francisco. Advocate general opinion in Nokia: a blow for trademark owners? Advocate General Cruz Villalón’s opinion in Nokia Corporation v Her Majesty's Commissioners of Revenue and Customs (Case C- 495/09), concerning the interpretation of the EU legislation governing actions by the customs authorities against infringements of IP rights where goods are in the ‘external transit’ procedure, has stated the need for “the beginnings of some proof” that goods may infringe an IP right. Are donations of counterfeit goods to charities socially acceptable? Nokia v HMRC: will the ECJ undermine the EU Customs Regulation? Litigation in the United Kingdom can be costly and time consuming. Many IP disputes are therefore resolved by settlement. However, where a dispute cannot be resolved amicably, one or both parties may consider that the dispute warrants court intervention. There are no administrative remedies available for the enforcement of IP rights in India. Therefore, the possible options for seeking relief are through the civil or criminal route, or both. Romania has experienced rapid growth in IP rights litigation over the past 10 to 15 years, with a particular focus on trademarks, patents and copyright (in 1995 there were only around 20 to 30 trademark cases in total). The trend continued after Romania joined the European Union in 2007, and there are an increasing number of cases in which Community trademark rights are at stake. US trademark owners can enforce their trademarks against an infringer under either Section 32 or 43(a) of the Lanham Act (15 USC Section 1051 and following). Section 32 provides for relief from the use in commerce of any copy or colourable imitation of a registered trademark in connection with the sale of, or offering for sale of, any goods or services that is likely to cause confusion or mistake, or to deceive. Just as the trademark marketplace is constantly changing, the law is always developing. Effective trademark enforcement therefore requires that counsel carefully consider the surrounding circumstances of each case. Have you ever thought about the best way to defend your trademark in Mexico? It is not easy to recommend a specific path to follow in order to safeguard or preserve a trademark right, since rights holders can choose from a wealth of diverse strategies to protect marks or tackle infringement. In the event of a trademark or company name (trade name) being infringed, the proprietor can take certain action against the infringer, including a cease and desist action, claims in damages or proceedings for the disclosure of information and for destruction. In September 2010 Russia’s High Arbitrazh Court submitted to Parliament a draft bill which provided for the creation of an Intellectual Rights Court, scheduled to arrive by 2012. In the meantime, rights holders have a range of options for enforcing their rights.